We are centrally located in Kusadasi, which helps to make us the convenient answer to your travel needs. • Private Ephesus Tours from Kusadasi . 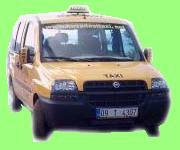 With Our Kombi-Rommy Doblo/Fiat Taxi and Minibus you will have a safe, comfortable and airconditioned Ride to your destination in Turkey.